Sometimes the charge total on an opportunity isn’t what you’d like to charge your customer. For example, you might like to round an opportunity down to the nearest hundred or make figures for opportunity groups friendlier. 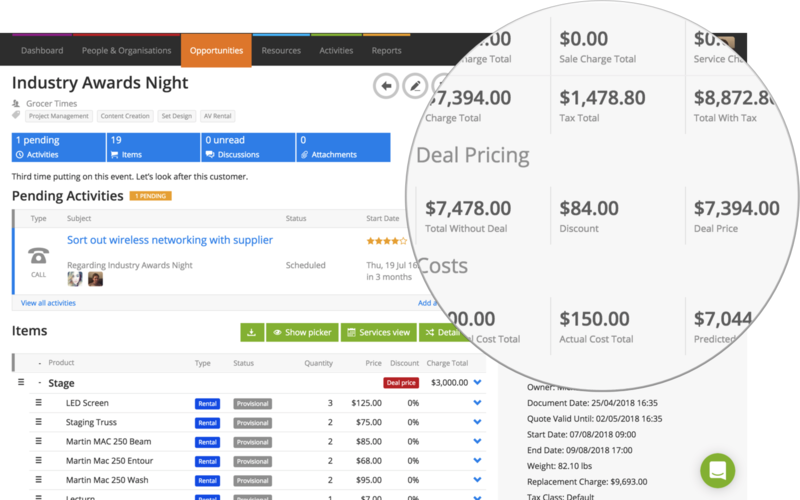 Use Deal Pricing to set a deal price on an opportunity or on opportunity groups, overriding the charge totals with your deal price. With deal pricing, you may still adjust prices and provide percentage-based discounts on items. 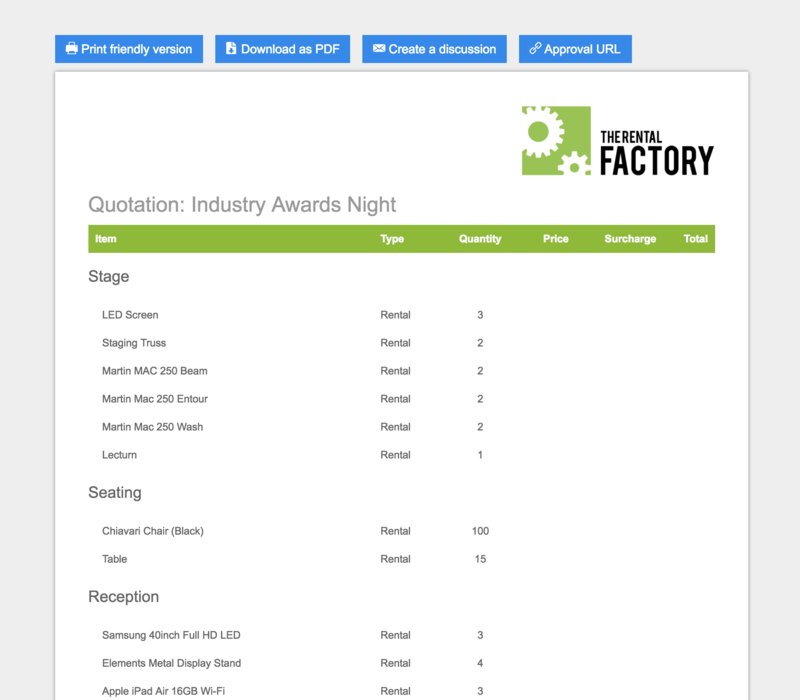 Deal prices can be set on groups – great if you quote your customers by group, e.g. rooms or areas. Revenue is correctly distributed amongst items, so your product reports will reflect the amount of revenue generated as part of the deal price. Non-discountable items can be part of an opportunity with a deal price, but their revenue is never adjusted. 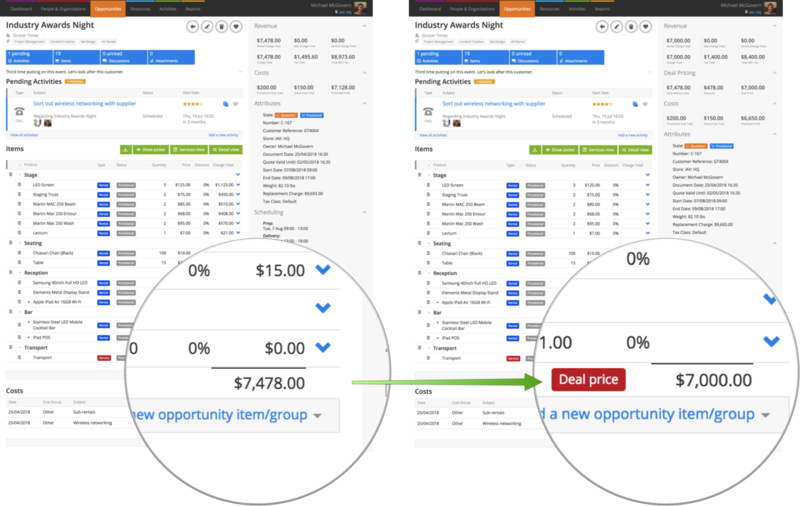 To offer a deal price on an entire opportunity, from an opportunity click Deal Pricing under Actions. On the Deal Pricing pop-up, Current RMS shows you the existing charge total for reference, discount applied as a result of the deal price, and the deal price right now. Pop in your deal price and hit Set Price when you’re done. 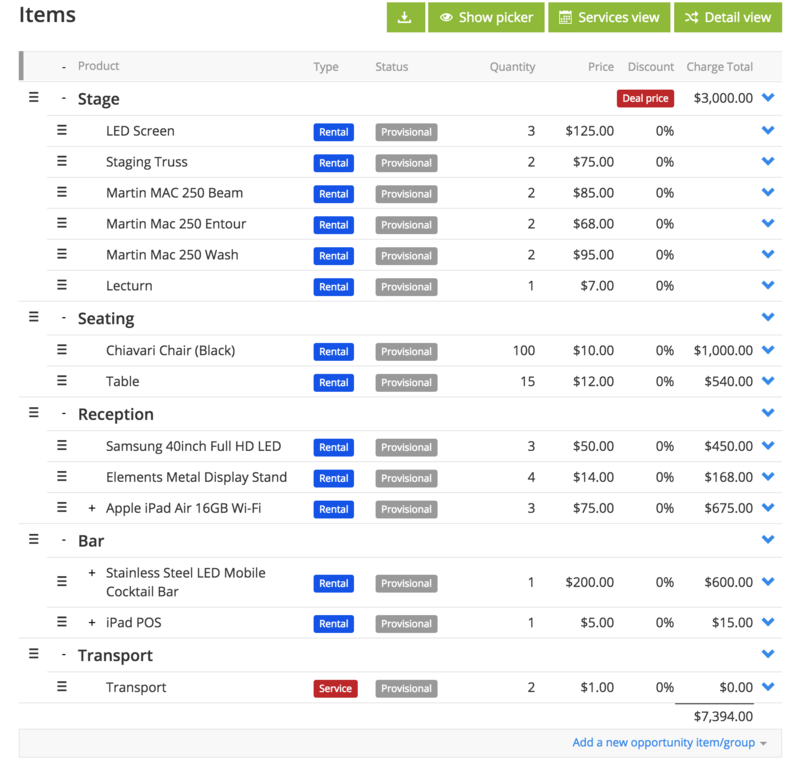 Charge totals are hidden in the items list and you’ll see that the charge total is updated with a red “deal price” label. 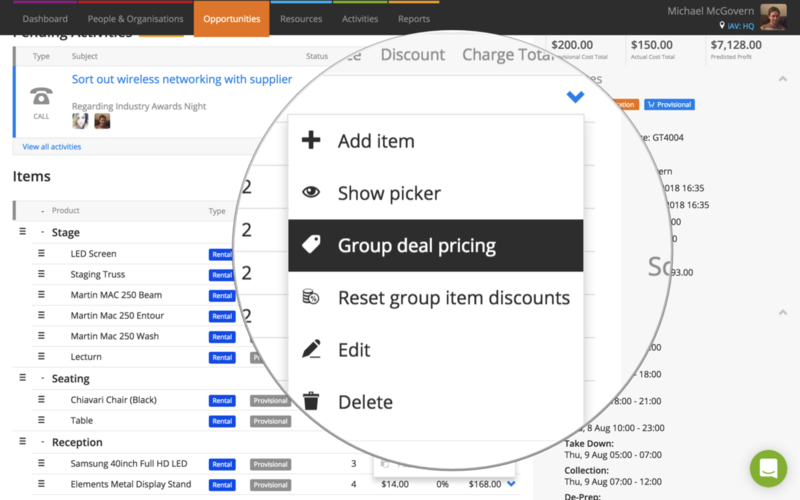 To set a deal price for a group, click the blue arrow next to a group and choose Group Deal Pricing from the menu. You’ll see the same pop-up as above with information about the group’s totals. Pop in your deal price and hit Set Price when you’re done. 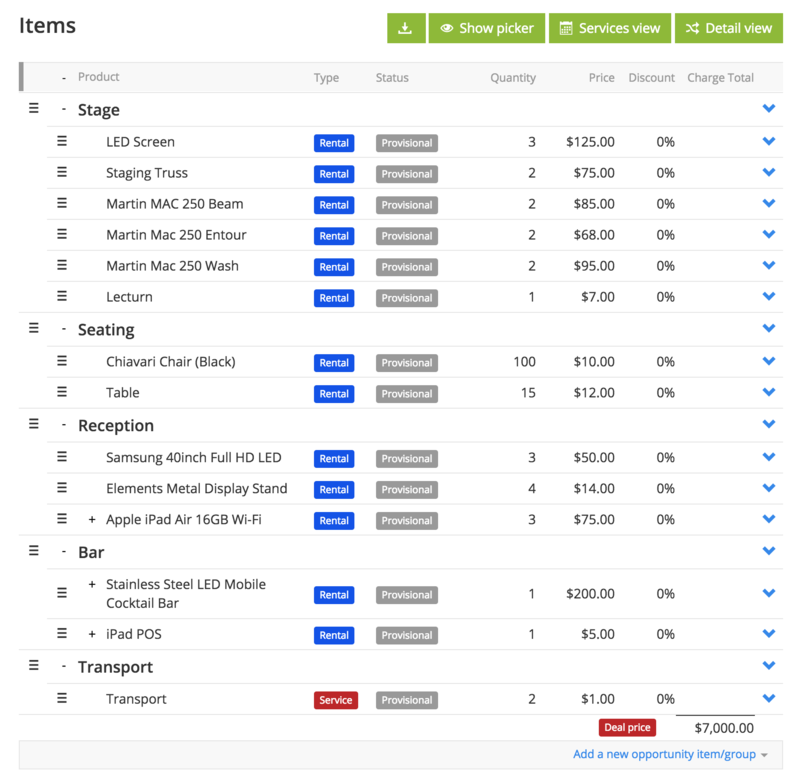 Charge totals for items in the group are hidden in the items list and you’ll see that the charge total is updated with a red “deal price” label. You can’t apply a deal price to a group if you have a deal price set on the opportunity. If you set a deal price on an opportunity, deal prices on groups will be removed. 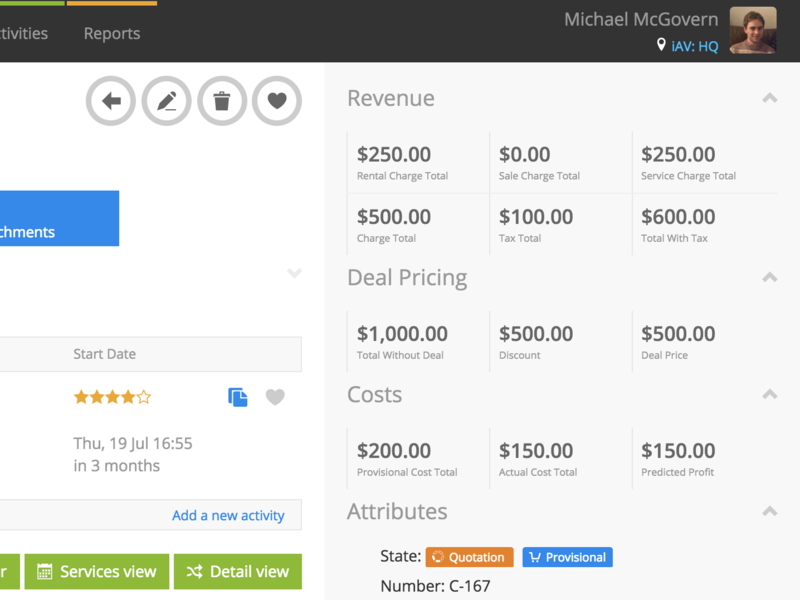 Information about deal pricing is shown at the top-right of your opportunity under the revenue section. Current shows you the charge total before deal pricing, the total discount as a result of deals, and then the deal price. You may always click a group’s deal price to bring up the Deal Pricing pop-up to review the original charge total and deal price. The charge totals in the revenue section at the top-right are based on your deal prices. Current RMS automatically calculates what proportion of the deal price is rental, sale, and service. For example, if you have an opportunity with a charge total of $1000 made up of $500 of rentals and $500 of services, then set a deal price on the opportunity of $500, you’ll see a charge total of $500 with $250 in rentals and $250 in services. This is calculated for groups in deals, too. Revenue for non-discountable items is never reduced when performing these calculations, so if you have $100 worth of non-discountable service items on an opportunity, your service charge total will always be at least $100 and apportioned revenue will be adjusted accordingly. 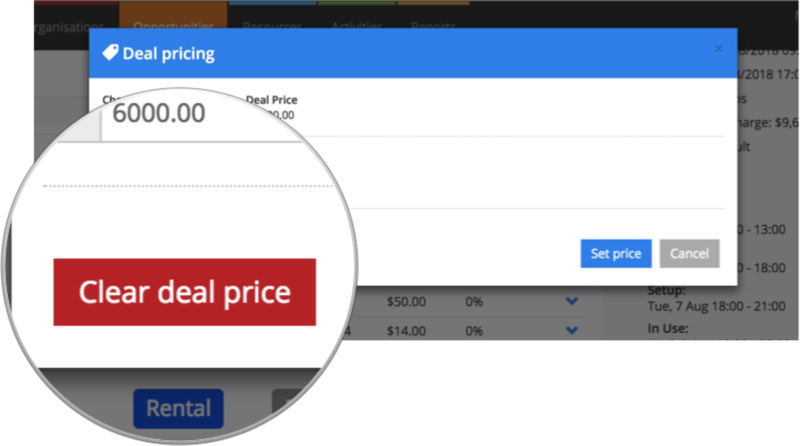 To clear a deal price, click on the deal price and click the red Clear deal price button on the Deal Pricing pop-up. When you invoice from an opportunity with a deal price, the invoice created is slightly different to invoices created otherwise. 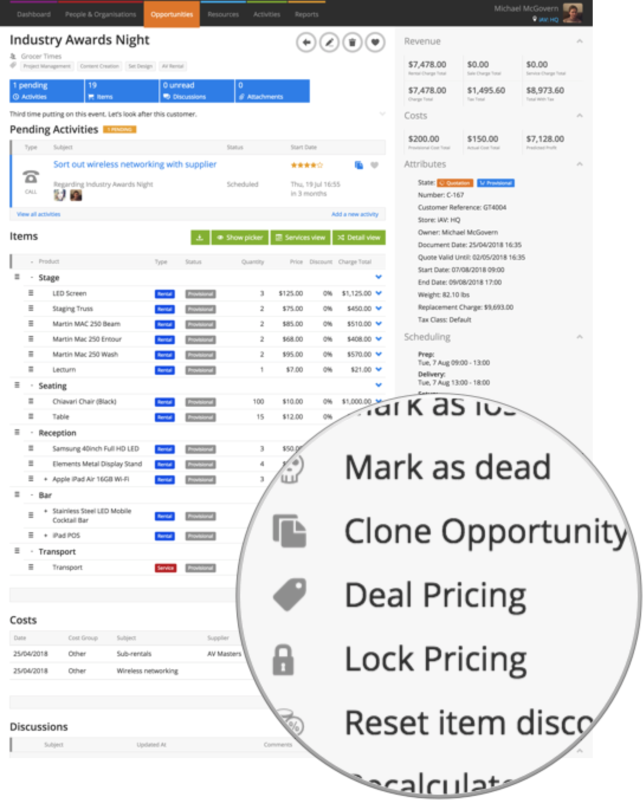 Documents that you generate from an opportunity will mirror the items list, so charge totals for any items that have a deal price will be hidden. Signed up before May 2018 and use customized documents? If you signed up before deal pricing was introduced, we recommend you test any customized documents with Deal Pricing before starting to use it. Changing the “Apply customer tax” setting to “before discount” in System Preferences has no effect on the deal price. Tax will always be applied after the deal price has been taken into account. For example, if you have a tax rate of 20% and an opportunity has a charge total of £200 with a deal price of £100, the tax will be £20. When this setting is turned on in System Preferences, the deal price is considered the final charge and is inclusive of tax. Normally on an opportunity, catalog prices on an opportunity include tax at the store address. If your system is set to calculate tax based on delivery or billing address, the final charge is calculated by taking the item charge, subtracting the tax at the store address and then adding the tax at the delivery or billing address. When working with a deal price, as the deal price is considered the final charge, tax is calculated based on the method set in System Preferences. This means that if you have catalog prices including tax and your tax calculation is based on billing or delivery address, items within a deal may have tax applied differently to those not in a deal. Why can’t I set a deal price? It sounds like you might have locked pricing on your opportunity. When you lock price, you can’t adjust deal prices. Hit Unlock Pricing under Actions to unlock and change deals.